Apparently last Thursday was not just another Thursday for a young girl behind the counter in a Dallas coffee shop. Her smile is wide and beautiful, but her voice hinted at something hidden behind her metallic barista nametag. “How are you doing today?” I said as she began pouring my coffee. “Well, okay I guess,” she said. Hesitation punctuated her words. “Actually I’m nervous.” Her confession surprised even her. Turns out she is a college student who also happens to be an African-American worried about what the new administration might mean for America. “I’m worried about things changing back,” she said. She began sharing with me of what friends and family were telling her about how the world would be changing with Donald Trump in the White House. She was nervous and concerned days of prejudice and ugliness would return. Inside I hurt for the college student and I found myself wanting to relieve the pain she was carrying around with her. But I also knew there was no way for me to accurately appreciate or recognize the fears she carried. With decades between us, our worlds are different. She is African-American and I am not. Her future is before her; mine is approaching the home stretch. She has been politically aware of one president for most of her lifetime. Trump will put me near a half dozen. I also know Trump will be the forty-fifth president and another will follow. I know the words I shared with her are true but also carry the heavy burden of others getting productively engaged if this thing gets off the tracks. We, as a nation, owe it to this young woman and others to not passively sit by while a government – regardless of who sits in power – attempts to reshape or attack the rights of others. I know I will not. The barista looked up and offered me a broken smile. “I hope so,” she said, her words trailing softy off. I wanted to give her a hug. I then told her while the world does contain a number of people who are truly ugly and cruel, the vast majority of Americans are good people. And those of us who know how far we’ve come to get where we are today will be damned if we let this nation go backward in regards to women’s rights and the basic freedoms extended to all regardless of race, creed, or color. And for the next four years, I will be working to keep my word to the young college student. Little steps lead to big steps. “I’m going on twelve years clean and sober,” said the man sitting in a plain chair. Black molded plastic and four thin metal legs support a man whose journey is one most of us can never envision. He smiles, his salt and pepper mustache colored with a touch of yellow nicotine above his upper lip – a subtle tell of not being a stranger to a cigarette or two. At a local community church outreach, homeless and others in need are invited for free haircuts. No questions, only love, a hug or two, and a haircut. The event, staffed with volunteers – even those cutting – are here because they want to help. What they don’t know, nor does anyone else, are the personal stories sitting beneath the black cloths that drape around each of the guests. His eyes are bright as the hair stylist weaves his unkempt hair between her fingers, carefully threading strands between the black teeth of a comb as the silver blades of scissors cut a horizontal line. With each pass for the shears, a new person is being revealed from behind the hair. “Yes, I did my share,” he said. Alcohol, drugs, and other things he’d just as soon not remember, litter his past he tells me. “But I’m clean now,” he says again, this time as a statement. The words he now owns – he’s earned them and knows it. I congratulate him. He tells me about his path, one of time in the military and bouncing around different areas. But what he knows now is each day is a blank slate and it is up to him to succeed against the odds. Life is hard. People who fight substance abuse face an even more difficult road – one filled with misguided solutions to pain and people who care for you is superficial at best. Having no one to turn to or anywhere to turn when you need it the must be one of the truest definitions of loneliness. And for most of us, we can only feebly relate through our limited imagination of such circumstances. Looking down around the man is a pool of black and white clippings. He looks remarkable. A transformation is occurring before my eyes. Even his spirit is lifted by his new appearance. Magic is happening. The next day our paths cross inside a church service – he’s taken me up on my offer to visit. Sitting within feet of where his remarkable transformation occurred 24 hours earlier, he and I visit again. He’s strong, solid, and confident. I notice a silver bracelet on his left arm. “My brother-in-law was a welder and made it for me when I got clean,” he said. 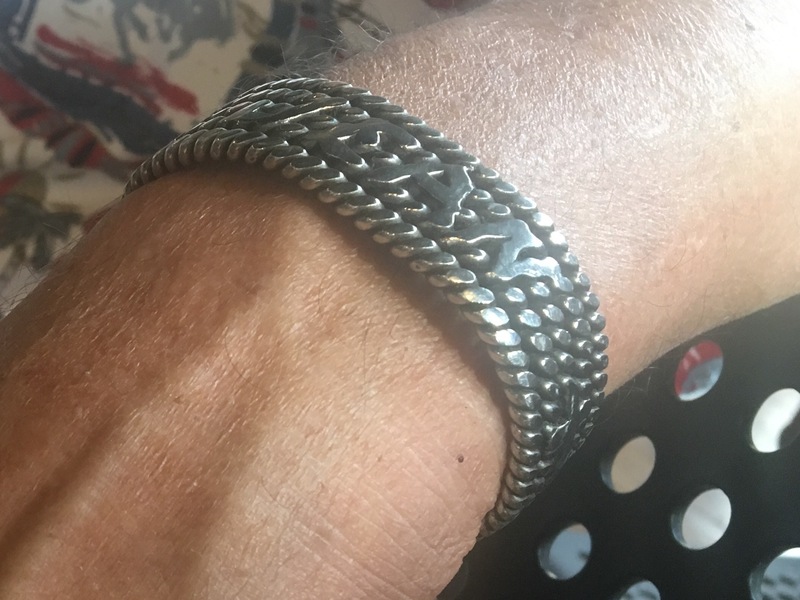 Slipping the heavy silver object off his wrist, he proudly shares with me. Much like my new friend, it is worn, shows a few nicks, but regardless is strong and proud. The bracelet is more than a piece of beautiful woven metal rope – it is my friend. Wednesday I had lunch with the last man on the planet who is not on social media. “The only ‘insta’ I use is instant oatmeal,” he said. He’s not a nut. Actually, he is a highly intelligent man schooled and deeply accomplished in the media world. And better yet, he was saying this long before others began to question their blind integration of social media in their lives. My lunch friend, the one who limits his ‘insta’ to instant oatmeal, is also a perfectly well adjusted and successful person. He has a wonderful wife, kids, and probably a mortgage. He looked back at me like I’d asked him how did he live without a daily dose of cod liver oil. Remarkably the blinding shine of social media is beginning to fade. After years of unbridled enthusiasm, many people are beginning to question the time and effort they invest in social media. And furthermore, with a seemingly new option hitting the app store every time you turn around, where does one decide to put efforts? In the United States, the average user is not a teenager, college student or newly married family with kids. On the contrary, those users are exactly the ones abandoning social media in legions. Nearly 43% of all users are over the age of 40. Some younger users already are recognizing social media may not be all it is cracked up to be. My lunch friend is an example some whose life many may look to longingly – a time before notifications, likes, and emojis floating across their screen. He feels no pseudo social pressure to participate in conversations because someone tagged him. He is even free to think political thoughts – and not share them across the digital landscape. Yes, he is a man at peace with himself and the world around him. This week I shared a video with friends about how social media is creating a world of terror between the ears of today’s youth (and others). Social media, the speaker said, is like a drug – literally. “Every time you receive a “like”, tag, or notification, your brain releases a shot of dopamine – the natural chemical designed to make us feel good,” he said. He’s not recommending legislating social media, but he goes on to identify how social media is a leading or contributing factor in rising teen suicides and other dysfunctional activities. Life on social media looks great – even when your life is crap. And the images and implied on social media can be lethally destructive to users. I envy my friend at lunch. His world is what he sees, who he speaks to, what shows up in his email. When someone unfriends him, he moves on. “Kinda” is not your friend. Recently one of those auto-play videos embedded in a newsfeed on my phone began to play. Nine times out of 10, no make that 99 out of 100, I find these annoying and intrusive. I simply dismiss and scroll past. The speaker, standing in a wide-open space at the foot of a mountain range, told everyone on the other end of the message that “kinda” was not their friend. As a matter of fact, the behavior actually contributed to people’s unhappiness or dissatisfaction in life. “If you kinda do anything, you’ll only kinda get results,” he said. He mentioned if you only “kinda” stick to your diet, you’ll only “kinda” get results. If you only “kinda” show up at the gym, you’ll only “kinda” see changes from the time invested. “Kinda” is not your friend, he reiterated. I thought about this and how, at the beginning of a new year, many people make resolutions to change their lives. Lose weight, exercise more, spend more time with family seem to be perennial favorites. But as the speaker said, pointing to the mountain behind him, if you only kinda try to reach the summit, your results will only kinda be successful. You have to commit and not only prepare to sacrifice but fight meaningless distractions from getting in the way of you perusing your goals. If not, you are only kinda working towards your goals. Researchers say that the most common pain people experience at the end of their life is the regret for the things they did not do. Rarely do people, when faced with time running off the clock, do they focus on the things they did, but rather the trips they didn’t take, the people they didn’t fully love, or how they could’ve more meaningfully committed to the truly important things to them in life. I don’t know about you, but “kinda” living does not sound appealing. Today I am at the age where I can look both forward and back at the time my life should cover. And I can see both opportunities and moments in life when I let “kinda” steal away joy and reward from me. And I also know, I let it happen – as easily as grabbing a handful of sand on the beach and watching it slip through my fingers, never really valuing the grains falling away. After all, there was always another handful of sand to grab by simply bending down to the ground. But today I know different. And like others, brushes with death or other life-changing events served as the wakeup call I needed. I clearly remember when I realized “kinda” was not good enough – and I’m better for the experience. The speaker continued to jump around the small screen in the palm of my hand, his voice moving melodically. But in the end, I knew what he meant – and his words were beautiful music to my ears.